Lands’ End is a clothing and home furnishings retailer that was created in 1963. It all started when Gary Cromer and four friends opened a mail-order business in a basement office in Chicago. At first, the company sold yachting gear via catalog, with just over a dozen orders daily. Within a decade, Lands’ End acquired a loyal following because of its high-quality products and excellent service. Eventually, the company’s merchandise shifted from boating gear to casual apparel and home accessories, most of which are sold online or through retailers. Lands’ End was acquired by Sears in the early 2000s and is now a publicly traded company. If you want to save on your next Lands' End online order, you have come to the right place. 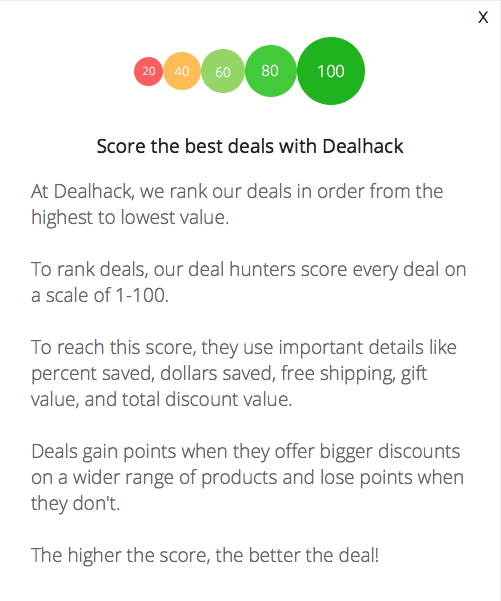 Our team of coupon lovers here at Dealhack work hard to make sure we have the best Lands' End coupon codes and special offers. Lands’ End prides itself in expertly made apparel that is comfortable and long-lasting. The company offers stylish outfits that you can wear at home, in the office, at school, or while engaged in your favorite sport. Available in solid colors and classic patterns, Lands’ End merchandise are easy to mix and match. These products are made from durable materials such as Ponte knit, wool, or cotton with luxurious textures. Busy? You can also opt for no-iron versions. Lands’ End also has a wide range of sizes, from petite to plus tall. Aside from casual apparel, Lands’ End sells durable bags, everyday shoes and attractive home furnishings. Lands’ End also offers add-on services like personalization, gift cards, gift boxing, and cuffing or hemming. Customers can subscribe to the Lands’ End print or e-catalog free of charge. Take advantage of semi-annual and seasonal sales and get discounts of over 50% on selected items on the sale page. It’s also a good idea to register for the company’s email newsletter to get announcements about the latest promos and offers. Lands’ End also has a Shop Your Way Rewards program that lets you earn and redeem points. Membership is absolutely free. Satisfied with your purchase? Refer the company to your friends via email and all of you will receive a reward the next time you buy from Lands’ End. Follow Lands’ End on social media for great deals and style inspiration. The company has accounts on Facebook, Twitter, and Instagram. Plus, you can also follow Lands' End on Pinterest, YouTube, and Google+. You can order Lands’ End products over the phone or via the company website. For real-time assistance, dial 1-800-478-8508 from 8 AM to 9 PM CDT from Monday to Friday, or click on the Live Chat button. If you prefer, you can also send a tweet to @ASKLANDSEND, email [email protected] or fill out the contact us form on their site. Customers can sign up for the Lands’ End print or e-catalog free of charge. You can also take advantage of the semi-annual and seasonal sales on the Lands’ End website. Get discounts of over 50% on selected items simply by checking the sale tab. Refer a friend to the Lands’ End site and you will both receive a 25% discount on your next order. Subscribe to the company’s email newsletter to get announcements about the latest promotions and special offers. You will also receive a coupon code for your next order just for signing up. Join the Shop Your Way Rewards program to earn and redeem points. Membership is absolutely free. What is Today’s Best Lands' End Promo Code? The best Lands' End promo code right now is FROG & 4297. This code is for 'Receive 50% off 1 full price style at Lands&apos; End. Use code FROG and pin 4297. Online only. Shop now. Ends 4/18'. Copy it and enter it on the Lands' End checkout page to use it. Standard USPS Shipping is free for a minimum purchase of $50 for all 50 states, including US territories and AFP/FPO addresses. On average, you can expect to receive your Lands’ End shipment within 4-6 business days or longer for personalized products. Fees for shipping and handling will depend on your location. Lands’ End has a guaranteed return policy that lets you return products, no questions asked. Once you return an item, you can opt for a refund of the original cost or a replacement item. For more details on the company’s return policy, visit their site.